Hello everyone! What a semester it’s been! The time is flying by, and my seminar is coming up soon. As a requirement for my Master’s degree, I have to present my research to the department of Chemistry in a 40 minute presentation. While, I’m crazy nervous, I’m also excited for it. My research is going well, and I think my talk will go well too. I’ve been working hard on it over the past few months, just slowly picking at it as I write my thesis. My goal is for people to leave it and be blown away with how well it was. I’ve been to some incredible department seminars, where I left thinking, “Wow, I wish I could present like that.” That’s my goal. Hopefully that happens, but I’m also okay with people just telling me I didn’t seem nervous. That would be a win for me. Once this blog post comes out, I’ll be less than a week away from presenting, which seems frightening to me as I sit here and write this. On March 14th, send me good thoughts and I hope it goes well. Last month I had the opportunity to attend an event here at Mun specifically for women in science. 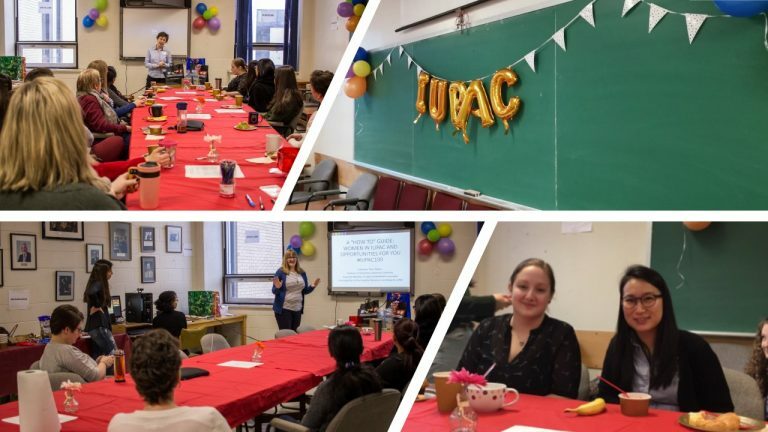 The IUPAC Global Women’s Breakfast, which was organized in universities around the world, was held to give women in science an opportunity to network with other women. Many professors, graduate and undergraduate students, as well as other faculty came to the event. It turned out to be a fun experience, and I even won a mug from a periodic table trivia event (all that weird knowledge finally paid off). Dr. Erika Merschrod and my supervisor, Dr. Fran Kerton, gave short talks about their perspective as a woman in science and advice for other women. They were both fantastic talks, but something that Erika said really resonated with me. She spoke about how when we’re asked how things are going or letting someone know how graduate school or even just research is, we tend to say it’s great and leave out all those negative things that happen. Personally, I have had a difficult time through graduate school, from the stress of the workload, stressing over research when things don’t work, figuring out that not everyone will be there for you, going through mental health issues… the list goes on. As a new graduate student, I would hear stories from everyone else about their amazing graduate school experiences. Hearing their stories made me feel inadequate. Why am I the only one having a hard time with this? I was not in a good place mentally, and it only made things worse. Now, almost two years into it, I’ve been speaking more and more to people inside and even outside my group, which made it clear that I was nowhere near the only one struggling. Everyone I spoke to has some sort of problem making graduate school difficult for them. It’s easy to think that you’re the only one struggling when everyone keeps those struggles to themselves. I’m guilty of it too. I didn’t really reach out to anyone for help, out of fear that people would think I was stupid or not good enough for graduate school. When asked about graduate school, I always gave the standard answer that I had gotten from so many of my peers, “It’s great!” or “It’s so fulfilling. Definitely do it.” I had my family and boyfriend at home who helped me with the mental health stuff but thinking that I was the only one struggling made it so much worse. It put a strain on relationships and ruined the time that I had outside of school. While it’s hard to tell the truth about the struggles you’re having, it can help to tell other people what’s really going on. Since I’ve started hearing stories from other graduate students and even the profs, it has helped me realize that I’m not alone. Very few, or most likely no one, has an easy time in graduate school. It’s a lot of work, you work with a lot of people with strong and different personalities than yours, and sometimes research – especially in science – doesn’t work out. It’s a lot to manage, even for people who enjoy the research and challenge. The point is, you’re not the only one suffering, although it can be easy to feel that way. We should all start being more truthful about the struggles that plague certain career paths. So, if someone asks you how your field of work is, or how graduate school is, don’t give them the rose-coloured glasses version, but the truth. It’s hard work and sometimes you’ll feel like you’re struggling, but you must remember that you are never alone. The best way to combat all these negative feelings is to speak to those around you. And if you’re not someone who is struggling, the chances are that someone around you is. There has been a substantial increase in the exposure of mental health over the last few years, with many campaigns centered on telling people to reach out for help. While the exposure is great and talking about mental health can only help, don’t forget that it is just as important to reach out to those people in need of help. It can be hard to speak up about your own mental problems. Just a simple conversation can make someone feel better. I know that whenever I feel bad, a quick chat with a friend, groupmate, or family can take some of the worries off my shoulders. Vent those frustrations and get some feedback. Sometimes you’ll see that your worries aren’t as bad as you thought, or someone has some good advice on how to handle it. You’ll never find out unless you talk to those around you. At the same time, it can be hard to approach someone when you don’t feel like you can trust them, they might judge you, or you don’t feel comfortable. So, again, if you see someone having a hard time, the best thing you can do is give them a shoulder to lean on. If we all look out for each other, graduate school, life, or even a difficult job doesn’t have to be mentally draining. So, take care of each other, be nice, and don’t lie about the common struggles in your field, it really helps no one. Have a wonderful rest of the semester and I’ll talk to you soon! 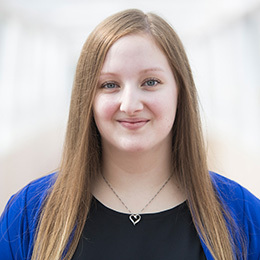 Courtney Marlene Laprise is from Angus, Ontario, Canada and is completing a Master of Science in Chemistry.